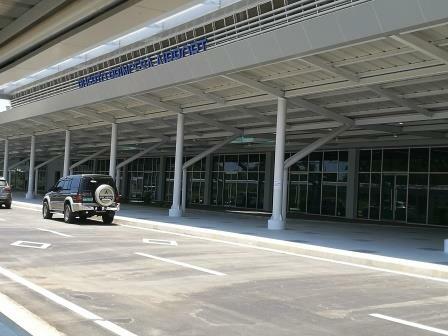 Aviation Updates Philippines - The Philippine Department of Transportation (DOTr) and Civil Aviation Authority of the Philippines (CAAP) inaugurated the brand new Puerto Princesa International Airport terminal in Palawan on Wednesday. The airport project was part of the "Build, Build, Build" infrastructure development program of the Duterte administration. NEW AIRPORT TERMINAL. The construction of the new airport terminal complex is said to boost trade and tourism in Palawan. Photo by Cebu Pacific Air. Puerto Princesa's new terminal will be open for commercial operations on May 4, 2017. Airlines which are expected to operate in the new terminal are Philippine Airlines, PAL Express, Cebu Pacific Air, Cebgo and Air Asia. Present during the inauguration ceremony were high-ranking officials of the DOTr, led by Transportation Secretary Arthur Tugade and Director General Captain Jim Sydiongco. Korean Ambassador to the Philippines Kim Jae-shin, local government officials, led by Palawan Governor Jose Alvarez, Puerto Princesa Mayor Luis Marcaida III, and aviation stakeholders were also present during the opening of the new terminal. Built by a South Korean contractor, the P3.8-billion passenger terminal covers 13,000 square meters and has a seating capacity of 15,000, according to sources. It can accommodate up to 1.9 million passengers annually. Included in the project is a state-of-the-art navigation equipment that complies with international standards. The airport can also accommodate two wide-body aircraft and four smaller aircraft at the same time. Low-cost carrier Cebu Pacific has confirmed in a separate statement that the airline will transfer its operations to the new terminal starting May 4, 2017. "With the new airport able to handle international flights, it now makes Puerto Princesa attractive for direct connections to and from key foreign tourist markets. And by offering more seats, CEB will be able to provide even lower fares, allowing more Juans to see the beauty that is Palawan," said Atty. JR Mantaring, CEB Vice President for Corporate Affairs. The airline is currently the largest carrier operating in and out of Puerto Princesa, with a total of 550 flights to and from the capital of Palawan weekly via three of its major hubs: Manila, Cebu and Iloilo. In 2016, CEB flew the most number of passengers to and from Puerto Princesa, garnering over 50% of the total market share.